Donkey Kong 3 is something of the red headed cousin of the Donkey Kong series. Uncharacteristic of the previous games, it is a shooter rather than a platform game. Why Nintendo took Donkey Kong in this direction is unknown, but as Mario's fame began to escalate, this game did little to improve Donkey Kong's image. As such Donkey Kong wouldn't be heard from again for quite some time, while Mario would go on to become more recognizable than Mickey Mouse to a generation of children. Even more obscure was the hero of the game, a bug exterminator named Stanley. His only other known appearances were in two Nintendo Game & Watch games. The first was called Greenhouse where his job was, quite expectedly, to exterminate bugs. The second was the portable LCD iteration of Donkey Kong 3 which pit Stanley directly against Donkey Kong in a battle of bug spray and mosquitoes. Since Donkey Kong 3 never garnered as much fame as its predecessors, and because it appeared in the arcade around the time that the home video game market was experiencing its first crash in the United States, Donkey Kong 3 was licensed by no one for home conversion. 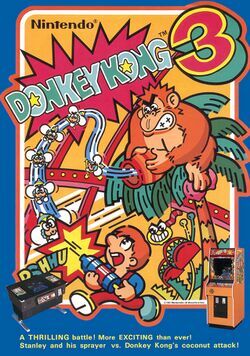 The first time that Donkey Kong 3 was made available for home play was on July 4, 1984 for the Famicom, making it the 16th game released for the system. DK3 would never be heard from again until 2001 as a bonus game in Nintendo's Animal Crossing for the GameCube, and shortly thereafter in 2003 as one of the Nintendo e-Reader games for the Game Boy Advance. After being freed by his son, Donkey Kong hadn't exactly learned his lesson. Rather than invading construction sites, Kong decided to set up shop in a greenhouse. Donkey Kong forms an alliance with the bees of the greenhouse who would love nothing more than to steal Stanley's vegetables. Now Stanley has to chase a hungry ape out of each section of his greenhouse and protect his plants. You control Stanley with the joystick. You clear a stage by either pushing Donkey Kong to the top of the screen with the sprayer, or defeating all the bugs that come out of the hives. Yellow stages are cleared by pushing Donkey Kong to the top. You must avoid contact with every insect and you must prevent Donkey Kong from climbing to the bottom of the vine. Use the pump to spray insecticide at the insects and to push Donkey Kong further up the vine. Once per life, a super spray can will be knocked to the floor by Donkey Kong. Collect it to fire super spray for a limited time. Protect the plants at the bottom of the greenhouse from being stolen for bonus points at the end of each stage.